The saga of the waste-to-energy plant in Okhla has taken a new turn, again. The office of the L-G of Delhi has jumped into the fray and called protestors later this week to learn about their grievances. This is after Union environment minister Jairam Ramesh set the ball rolling on a technical revaluation of the plant. On Wednesday, chief minister Sheila Dikshit also met agitating residents to tell them that the proposed plant was safe. The process will spread over a month as it involves scouting at a global level and the report will advise the Ministry of Environment and Forests on what changes should be made . “The report will come up with solution on a technology change or retrofitting in the existing plant so that the process is the safest if at all the plant remains to function over there. We had thought it would take a month, but it seems like it will take much more than that,” said Prof SP Gautam, chairman, CPCB. The project has invited the environment ministry’s attention as activists have pointed out that project developers have not yet got the fresh environmental clearance. The present promoters had purchased it from a susbidiary of Infrastructure Leasing and Financial Services Limited. “The environment minister has written to the state government about this,” said a senior government official. According to Toxics Watch, an environmental group against incinerator technology, it is a violation that calls for immediate closure of the project. “We have documents through RTI that proves this,” said Gopal Krishna of Toxics Watch. On Wednesday, residents of Okhla, Sukhdev Vihar, Jamia Nagar and Haji Colony — resisting the plant — met CM Sheila Dikshit who told them the project posed no health hazards. “The meeting was disappointing because the CM did not listen to our objections. She stormed out in anger when we raised objections. 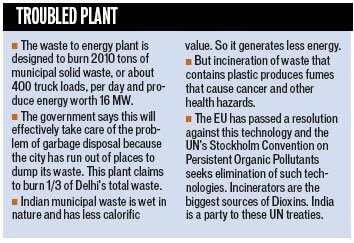 She just wanted us to listen to her officials saying that the plant was fine,” said Asha Arora, spokesperson for the Okhla Anti-Incinerator Committee.